Another review of a Chinese restaurant? You bet! By now it should be no surprise to anyone how much I like Chinese food – I have it as often as I can, and that’s pretty often… In recent weeks, I’ve been going to King’s Noodle Restaurant and to Rol San (both in Chinatown) most often, but I’m always on the lookout for new places to try. Both Rol San and King’s are consistent and dependable so I’ll admit that trying out a new place can be a difficult leap sometimes – you never know what you’re going to get in terms of quality and it’s always a risk. Lately I’ve haven’t been in the mood to take any risks, (only to end up disappointed), so I’ve just stuck to places where I know I’m guaranteed to have a good meal. Just under three weeks ago, however, I was getting a little tired of the same routine and was feeling up to taking the risk to try a new place out. There are so many restaurants in Chinatown and I’m constantly wondering what hidden gem I’m missing out on by always sticking to what I know. After all, I never would have found Rol San or King’s (or even Crown Princess for that matter) if I hadn’t ventured out to try some place new at some point. 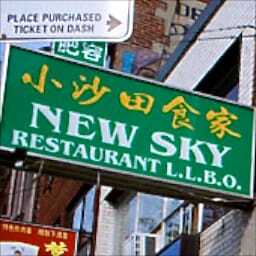 And that’s how I ended up at New Sky Restaurant – I was walking up and down Spadina Avenue with Michelle while searching some food apps on my iPhone and New Sky Restaurant was the highest-rated restaurant close to us. 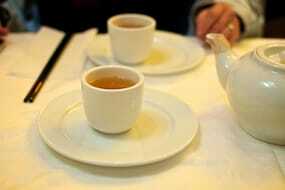 My first impression of New Sky Restaurant was a good one – we were seated right away as soon as we walked in, the decor of the restaurant was nice and above-average for Chinatown, we were served hot tea immediately after we were seated and the service was polite and attentive. We were off to a good start. I wanted to give New Sky a fair chance to make a great first impression so I ordered three dishes, which I knew would be too much food for us to finish, but I figured it would give me a much broader sample to form an honest opinion on their food. At the same time, I didn’t venture too far out on their menu and stuck to dishes I’ve had at other places for the sake of easy comparison. We started with Won Ton Soup and it was nice to have our waiter serve this into our bowls for us. At first, the won tons seemed a little salty to me, but they were packed with strong flavors that I really enjoyed, so it was easy to forgive the saltiness. They weren’t the best won tons I’ve had, but I did enjoy that they had a unique personality to them. The broth, on the other hand, was nothing spectacular, but still decent. 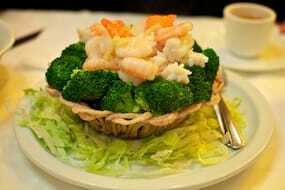 The Seafood Bird Nest came next and the first thing that caught my eye was the lettuce at the bottom of the plate. Not the best choice of garnish, but a common offense, so it was excusable. The seafood was definitely very fresh and tasty, but there wasn’t all that much of it either (for a seafood dish). The broccoli was the most memorable thing of the whole experience – it was overcooked to the point of being soggy and lost all its crunch – completely the opposite of what I’ve come to expect from broccoli at a Chinese restaurant. Apart from being way overcooked, I could also taste that it wasn’t very fresh, at least nowhere near as fresh as the seafood was. (The carrots were also lacking freshness and were similarly overcooked.) The actual "bird nest" was also the worst nest I’ve ever had anywhere. I don’t know what they put in it, it’s as if they made a batter and put taro root shavings in it for flavor. This same dish at Lee Garden is jaw-dropping delicious and there is no doubt that they use only pure julienned strips of taro root to make their nest – no batter or any other additives. I don’t know for sure if the nest at New Sky was made with some kind of batter, but the taro root flavor wasn’t very prominent and the texture of the nest was tough, chewy and almost inedible. A big let down for sure. 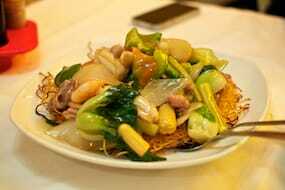 The last dish to come out was the Cantonese Chow Mein and that was as unappealing to the eyes as it was to the mouth. It looked dull, lifeless and colorless when it came out and you only had to look at the vegetables on top to see that they had also been sinfully overcooked to the point of sogginess. I’m also not a big fan of green pepper in my Chow Mein, but that’s being a little picky. By the time the Chow Mein came out, (which seemed to take forever), I had already lost hope in New Sky anyways, but it really was a sad attempt at Cantonese Chow Mein. To be fair, I remember saying to Michelle that it’s not exactly fair to come to a restaurant with a sign in their window that says "Szechuan Cuisine" and order only Cantonese dishes, and that maybe we should come back to give them a second chance and order only Szechuan dishes next time. But how can I feel compelled to return to a restaurant where I had a mediocre experience, with the abundance of restaurants I have yet to explore in Chinatown? At the same time, it’s not the flavor of their Cantonese dishes that was the most offensive – it was their substandard cooking techniques – overcooked vegetables are the same whether they’re in Cantonese, Szechuan or even Peruvian food. The service at New Sky Restaurant was their only saving grace and while it’s nowhere the level of service you’d get from Lee Garden, for example, it’s still above-average for most restaurants in Chinatown. Perhaps I just had a bad experience with the food (why else would it be rated so high in online reviews?) and to their credit, their won ton soup was somewhat memorable, but with more than fifty restaurants in less than a five block radius, you’re lucky to even get one chance to make an impression, no? New Sky Restaurant was published on Monday, April 16, 2012 at 1:00pm EDT by Daniel Menjívar and last updated on April 11, 2018 at 9:30pm UTC .